Received: February 7, 2017; Revised: May 7, 2017; Accepted: June 19, 2017; Published online: September 1, 2018. This study is to investigate clinical and radiological results of staged treatment using a temporary external fixator in bicondylar tibial plateau fractures (TPFs) and to evaluate correlation between prognostic factors and postoperative clinical outcomes. Twenty-four bicondylar TPF patients were selected. All patients were operated by a temporary external fixator first and then open reduction and internal fixation with dual plating. Clinical and radiological outcomes were evaluated. The mean American Knee Society score (AKSS) was 85.3. The mean Western Ontario and McMaster Universities Osteoarthritis index was 11.2. The mean range of motion (ROM) was 123.4°. The mean medial tibial plateau angle (mTPA) was 88.3°, and the mean proximal posterior tibial angle (PPTA) was 8.4°. Compared with the uninjured limb, the mean difference of mTPA was 1.5° and that of PPTA was 4.0°. The difference of PPTA and the AKSS demonstrated negative correlation (p=0.007). Patients with normal mTPA showed better ROM than those with abnormal mTPA (p=0.041). Staged treatment using a temporary external fixator in bicondylar TPFs showed good clinical and radiological outcomes. Surgeons should evaluate the reduction status intraoperatively by fluoroscopy and also refer to the uninjured limb radiologically. Bicondylar tibial plateau fractures (TPFs) usually accompany severe comminuted fractures and soft tissue injuries because of high energy trauma. Based on the complexity of the fracture that involves both medial and lateral condyles, extensive dissection of soft tissue can aggravate soft tissue injury because soft tissue of proximal tibia is very thin1–3). As a result, complications, such as skin necrosis, superficial or deep infection, and non-union, can occur. Treatment of bicondylar TPFs is still a controversial issue and is generally difficult because patients can suffer from postoperative arthritis and functional disability of the knee joint4–7). Many authors have reported that conventional open reduction and internal fixation (OR-IF) in bicondylar fractures can cause soft tissue injuries, leading to complications such as non-union, knee joint stiffness, and metal failure8–10). Several fixation methods can be employed to solve soft tissue problems including the use of a hybrid external fixator11,12) and staged treatment using a temporary external fixator13–15). Some authors have reported favorable clinical outcomes with staged treatment using a temporary external fixator9,16). The benefits of temporary external fixation include immediate osseous stabilization, prevention of further articular damage, access to wounds, increased patient comfort, ease of subsequent reduction, and potential for decreased narcotic requirements14). In the present study, authors have investigated clinical and radiological results of staged treatment using a temporary external fixator in bicondylar TPFs and evaluated correlation between prognostic factors and postoperative clinical outcomes. This study was approved by our hospital’s Institutional Review Board. Of the 70 patients who underwent operation for TPFs in our hospital between January 2012 and January 2014, 33 patients who presented with a Schatzker type V or VI fracture were selected. 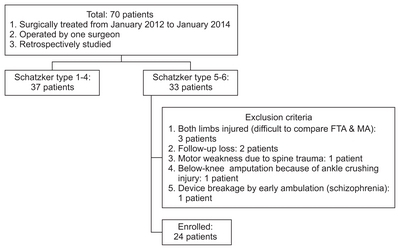 Patients were excluded if they had injuries in both limbs or an injury to the spinal cord with motor weakness, underwent above-knee amputation or early ambulation with metal failure, or were lost to follow-up. Ultimately, 24 patients were selected and retrospectively investigated (Fig. 1). The mean follow-up was 24.2 months (range, 15 to 32 months). Clinical details of the patients are described in Table 1. Patients were positioned supine on the radiolucent operating table before receiving general or spinal anesthesia. In cases where patients were diagnosed with compartment syndrome, the operator immediately made dual incisions (anterolateral and posteromedial incisions) on the calf followed by fasciotomy to all compartments. Compartment syndrome was diagnosed clinically by using 5P physical signs and symptoms (pain, pallor, pulselessness, paresthesia, and paralysis). In case of an open fracture, massive irrigation and wound debridement was done first and then a temporary external fixator was applied. However, in case of a closed fracture, an external fixator was applied immediately. Pins of temporary external fixators were carefully applied considering the position of medial and lateral plating. Subsequently, on a daily basis, authors carefully observed soft tissue of patients and planned appropriate time for final internal fixation with dual plating. In secondary plate fixation, under supine position, separate skin incisions which were anterolateral and posteromedial for dual plating (tubular plate or proximal medial plate [Synthes, Oberdorf, Switzerland], proximal lateral locking plate [Zimmer, Warsaw, IN, USA]) were done and the distance between skin incisions was kept to be more than 8 cm (Fig. 2). Basically, antibiotics were used for approximately 5 to 7 days after the second operation. However, antibiotics were used longer if the patient had other complications due to systemic trauma or open fractures upon confirming the wound status. We did not apply any splint or cast immobilization to prevent iatrogenic paralysis. The stitches were removed about 2 weeks after surgery. Range of motion (ROM) exercises using a continuous passive motion machine were started about 1 week after surgery and were increased gradually thereafter. Weight bearing was attempted at 6 to 8 weeks after surgery, and the degree of bony union was periodically evaluated. Authors evaluated the clinical and radiological outcomes as well as complications. Clinically, the American Knee Society score (AKSS), the Western Ontario and McMaster Universities Osteoarthritis index (WOMAC), the ROM, and bone union time were investigated after surgery. Bone union was considered obtained when formation of callus on the fracture site was clinically evident on the anteroposterior and lateral radiographs and when patients do not feel pain on the fracture site on weight bearing. The medial tibial plateau angle (mTPA), the proximal posterior tibial angle (PPTA), the femoral tibial angle (FTA), and the mechanical axis deviation (MAD) were also evaluated (Fig. 3). The MAD was measured by assessing the location of the mechanical axis crossing through the articular surface of the tibial plateau17). Authors also measured the mTPA and the PPTA of the uninjured limb preoperatively and calculated differences in the mTPA and the PPTA between the postoperative radiograph and the preoperative radiograph of the uninjured limb. Clinical results and radiological results were evaluated with regard to the correlation between the results. Furthermore, correlation between preoperative prognostic factors and clinical outcomes were evaluated. Demographic characteristics of 24 patients are presented in Table 2. At the final follow-up, the mean AKSS was 85.3±6.2 (range, 68 to 93), the WOMAC was 11.2±6.2 (range, 1.0 to 21.3), and the ROM was 123.4°±10.0° (range, 101° to 142°). The bone union time at the final follow-up was 16.5±4.6 weeks (range, 10.9 to 26.1 weeks). In case of metal failure (case no. 10), bone union time was measured from revision surgery (Table 2). The mean mTPA at the final follow-up was 88.3°±1.9° (range, 83.3° to 91.3°) and the PPTA was 8.4°±5.9° (range, 0.8° to 22.1°). The mean FTA at the final follow-up was 4.53°±1.9° (range, −3.3° to 10.6°) and the MAD was 44.9%±17.5% (range, 9.6% to 70.6%). Compared with the uninjured limb, the mean difference of mTPA (D-mTPA) was 1.5°±1.1° (range, 0° to 4.6°) and that of PPTA (D-PPTA) was 4.0°±2.8° (range, 0.1° to 10.7°). The mean difference of FTA (D-FTA) was 3.3°±2.0° (range, 0.5° to 8.0°), and that of MAD (D-MAD) was 12.3%±10.4% (range, 0.1% to 39.5%) (Table 2). The D-PPTA and the AKSS demonstrated negative correlation, which was statistically significant (p=0.007; Spearman correlation coefficient, −0.538). As in previous studies on comparison between the normal and abnormal groups18,19), patients with normal mTPA showed better ROM than those with abnormal mTPA (p=0.041). However, other radiological outcomes were not in correlation with the clinical outcomes (Table 3). Although it was not statistically significant, when the bicondylar fracture had open wounds, the ROM was worse (p=0.060). Other prognostic factors, for example, type of fracture, preoperative arthritic changes, compartment syndrome, and clinical outcomes showed no strong correlation (Table 4). Unlike in previous publications, the incidence of compartment syndrome in open fractures (25%) was relatively high; however, no statistically significant correlation was found between open fracture and compartment syndrome (p=0.388). By contrast, the incidence among closed fractures (50%) was typical (Fig. 4). There were two cases of complications. Case no. 10 (Table 1) required revision surgery due to metal failure 1 month after first fixation even though the patient did not start early weight bearing. Case no. 12 (Table 1) had total knee arthroplasty due to postoperative arthritis 2 years after first fixation. No other incidences of complications such as infection, knee joint stiffness, and malunion were seen. TPFs are generally caused by high energy trauma such as traffic accident or falling down. This intraarticular fracture is divided into many subtypes according to mechanisms of injury20). Reduction strategy and prognosis vary according to fracture types such as simple or complex. Nevertheless, the main goals of treatment of bicondylar TPFs are to recover the articular surface and alignment of the lower extremity and to maintain the length of legs21,22). There are several fixation methods of bicondylar TPFs such as conventional OR-IF, hybrid external fixation, and staged treatment using a temporary external fixator. Lee et al.23) reported a series of 45 bicondylar TPFs in 45 patients using conventional dual plating. The mean WOMAC was 34.1±4.91 (range, 0 to worst 96), and one case of infection and two cases of non-union were noted. Chae et al.24) also reported a series of 12 Schatzker type VI TPFs in 11 patients using conventional dual plating. The mean AKSS was 85.0±8.6, and there was one case of joint stiffness and one case of varus malalignment. Stamer et al.11) reported a series of 22 patients with Schatzker type IV TPFs treated with a hybrid ring external fixator using tensioned wires proximally and half-pins distally. The average AKSS was 84.7, and there was one case of pin tract infection, three cases of deep infection, and one case of malunion. Babis et al.12) also described 33 cases of bicondylar TPFs, which were treated by minimal intervention and hybrid external fixation. According to AKSS criteria25), the results were evaluated as excellent in 18 patients (55%), good in 10 patients (30%), fair in 4 patients (12%), and poor in 1 patient (3%). Egol et al.14) described staged management of high-energy proximal TPFs. The mean WOMAC was 95±55 (range, 0 to worst 240), the mean ROM was 106°±15°, and there were two cases of infection. Many other authors have also reported good clinical outcomes of dual plating using medial and lateral approaches after temporary external fixation13–15). Our study also demonstrated favorable clinical and radiological outcomes with staged treatment using a temporary external fixator. According to Chang et al.26), compartment syndrome can occur in 30% of bicondylar TPFs. When compartment syndrome is suspected, emergent fasciotomy is essential and subsequent temporary fixation is recommended. To our knowledge, there was no published report of comparison with uninjured limbs in TPFs. In our study, although not all radiological outcomes were statistically correlated to clinical outcomes, it was observed that patients with fewer differences with uninjured limbs on plain radiographs showed a tendency to have better clinical outcomes. In particular, the correlation was statistically significant for the PPTA. Some authors have reported that the reduction status on plain radiographs can affect clinical outcomes27). In our study, it was observed that when mTPA and PPTA were within normal range, the clinical outcomes were better, and especially, mTPA showed statistical significance. Authors propose that all patients should be evaluated not only for the injured limb but also for the uninjured limb to have better clinical outcome by referring to the angles intraoperatively. We did make an effort not only to recover mTPA and PPTA within normal limits using fluoroscopy intraoperatively but also to refer to the data of the uninjured limb in all patients. According to Egol et al.14), there was a significant association between the presence of external wounds and the need for a secondary surgery because of complications. In our study, although it was not statistically significant, clinical outcomes were not good in the presence of external wounds. Therefore, it is proposed that surgeons should warn the patients adequately about the possibility of worsening of clinical outcomes. Other prognostic factors such as the type of fracture, preoperative arthritic change, and compartment syndrome were not statistically correlated to the clinical outcomes. Although compartment syndrome occurs frequently in closed fractures, two patients (25%) of open fractures were accompanied by compartment syndrome in this study. Accordingly, primary physicians should do careful physical examination in cases of bicondylar TPFs. Staged treatment using a temporary external fixator in bicondylar TPFs showed good clinical and radiological outcomes due to appropriate soft tissue management. Furthermore, excellent results could be obtained by radiological evaluation of not only the injured limb but also the uninjured limb. Moreover, it is important to warn bicondylar TPF patients with external wounds about the risk of worsening of clinical outcomes before surgery. Fig. 1. Patient enrollment flow chart. FTA: femoral tibial angle, MA: mechanical axis. Fig. 2. Radiographs of case no. 19 presented in . (A) A 60-year-old male patient was injured in a pedestrian traffic accident and suffered a tibial plateau fracture (Schatzker type VI) as well as a fracture of the fibula. (B) A temporary external fixator was immediately applied after injury. (C) Six days after the first operation, dual plating using medial and lateral approaches was applied. Fig. 3. Radiological evaluation. (A) The medial tibial plateau angle was measured between the axis of the articular surface of the tibial plateau and the anatomical axis of the proximal tibia on the anteroposterior view of the knee. (B) The proximal posterior tibial angle was measured between the articular surface of the medial tibial plateau and the perpendicular line to the anterior cortical margin of the proximal tibia on the lateral view of the knee. (C) The femoral tibial angle was measured between the anatomical axes of the femur and tibia. Genu valgum was given a positive angle. (D) Mechanical axis and deviation of the mechanical axis. The mechanical axis was defined as a line connecting the center of the hip and the center of the ankle. Mechanical axis deviation was measured by assessing the location of the mechanical axis crossing through the articular surface of the tibial plateau. Fig. 4. 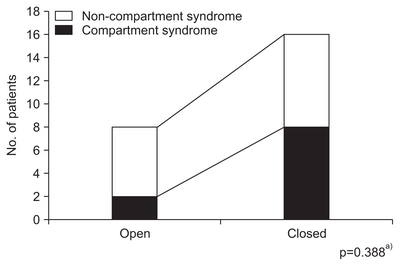 Correlation between open fracture and compartment syndrome. a)Fisher exact test. AO: the AO Foundation and Orthopaedic Trauma Association classification, Preop: preoperative, OA: osteoarthritis, G-A: Gustilo and Anderson classification of open fracture, TA: traffic accident, LCL: lateral collateral ligament, F/D: fall down, TKA: total knee arthroplasty, MCL: medial collateral ligament. AKSS: American Knee Society score, WOMAC: Western Ontario and McMaster Universities Osteoarthritis index, ROM: range of motion (flexion/ extension arc), mTPA: medial tibial plateau angle, PPTA: proximal posterior tibial angle, D-mTPA: mean difference of mTPA, D-PPTA: mean difference of PPTA, FTA: femoral tibial angle, MAD: deviation of the mechanical axis, D-FTA: mean difference of FTA, D-MAD: mean difference of MAD. D-mTPA: mean difference of medial tibial plateau angle, D-PPTA: mean difference of proximal posterior tibial angle, D-FTA: mean difference of femoral tibial angle, D-MAD: mean difference of deviation of the mechanical axis, mTPA-group: group difference between normal mTPA group and abnormal mTPA group, PPTA-group: group difference between normal PPTA group and abnormal PPTA group, ROM: range of motion (flexion/extension arc), AKSS: American knee society score, WOMAC: Western Ontario and McMaster Universities Osteoarthritis index. ROM: range of motion (flexion/extension arc), AKSS: American Knee Society score, WOMAC: Western Ontario and McMaster Universities Osteoarthritis index, AO: the AO Foundation and Orthopaedic Trauma Association classification, OA: osteoarthritis. Whiteside, LA, and Lesker, PA (1978). The effects of extraperiosteal and subperiosteal dissection: II. On fracture healing. J Bone Joint Surg Am. 60, 26-30. Lachiewicz, PF, and Funcik, T (1990). Factors influencing the results of open reduction and internal fixation of tibial plateau fractures. Clin Orthop Relat Res, 210-5. Littenberg, B, Weinstein, LP, McCarren, M, Mead, T, Swiontkowski, MF, Rudicel, SA, and Heck, D (1998). Closed fractures of the tibial shaft: a meta-analysis of three methods of treatment. J Bone Joint Surg Am. 80, 174-83. Apley, AG (1979). Fractures of the tibial plateau. Orthop Clin North Am. 10, 61-74. Hohl, M (1967). Tibial condylar fractures. J Bone Joint Surg Am. 49, 1455-67. Ibsen, JG, and Mossing, N (1971). Conservative treatment of tibial condylar fractures. Acta Orthop Scand. 42, 431-2. Sarmiento, A, Kinman, PB, Latta, LL, and Eng, P (1979). Fracutres of the proximal tibia and tibial condyles: a clinical and laboratory comparative study. Clin Orthop Relat Res, 136-45. Lin, S, Mauffrey, C, Hammerberg, EM, Stahel, PF, and Hak, DJ (2014). Surgical site infection after open reduction and internal fixation of tibial plateau fractures. Eur J Orthop Surg Traumatol. 24, 797-803. Moore, TM, Patzakis, MJ, and Harvey, JP (1987). Tibial plateau fractures: definition, demographics, treatment rationale, and long-term results of closed traction management or operative reduction. J Orthop Trauma. 1, 97-119. Young, MJ, and Barrack, RL (1994). Complications of internal fixation of tibial plateau fractures. Orthop Rev. 23, 149-54. Stamer, DT, Schenk, R, Staggers, B, Aurori, K, Aurori, B, and Behrens, FF (1994). Bicondylar tibial plateau fractures treated with a hybrid ring external fixator: a preliminary study. J Orthop Trauma. 8, 455-61. Babis, GC, Evangelopoulos, DS, Kontovazenitis, P, Nikolopoulos, K, and Soucacos, PN (2011). High energy tibial plateau fractures treated with hybrid external fixation. J Orthop Surg Res. 6, 35. Anglen, JO, and Aleto, T (1998). Temporary transarticular external fixation of the knee and ankle. J Orthop Trauma. 12, 431-4. Egol, KA, Tejwani, NC, Capla, EL, Wolinsky, PL, and Koval, KJ (2005). Staged management of high-energy proximal tibia fractures (OTA types 41): the results of a prospective, standardized protocol. J Orthop Trauma. 19, 448-55. Haidukewych, GJ (2002). Temporary external fixation for the management of complex intra- and periarticular fractures of the lower extremity. J Orthop Trauma. 16, 678-85. Sirkin, M, Sanders, R, DiPasquale, T, and Herscovici, D (1999). A staged protocol for soft tissue management in the treatment of complex pilon fractures. J Orthop Trauma. 13, 78-84. Honkonen, SE (1994). Indications for surgical treatment of tibial condyle fractures. Clin Orthop Relat Res, 199-205. Chao, EY, Neluheni, EV, Hsu, RW, and Paley, D (1994). Biomechanics of malalignment. Orthop Clin North Am. 25, 379-86. Paley, D, Herzenberg, JE, Tetsworth, K, McKie, J, and Bhave, A (1994). 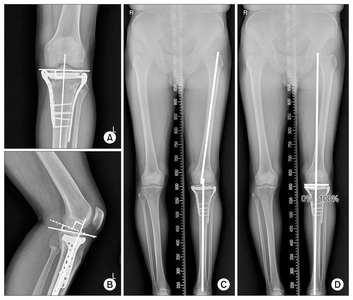 Deformity planning for frontal and sagittal plane corrective osteotomies. Orthop Clin North Am. 25, 425-65. Schatzker, J (1988). Anterior approach to the knee with osteotomy of the tibial tubercle for bicondylar tibial fractures. J Bone Joint Surg Am. 70, 1575-6. Marsh, JL, Slongo, TF, Agel, J, Broderick, JS, Creevey, W, DeCoster, TA, Prokuski, L, Sirkin, MS, Ziran, B, Henley, B, and Audige, L (2007). Fracture and dislocation classification compendium: 2007: Orthopaedic Trauma Association classification, database and outcomes committee. J Orthop Trauma. 21, S1-133. Tejwani, NC, Hak, DJ, Finkemeier, CG, and Wolinsky, PR (2006). High-energy proximal tibial fractures: treatment options and decision making. Instr Course Lect. 55, 367-79. Lee, MH, Hsu, CJ, Lin, KC, and Renn, JH (2014). Comparison of outcome of unilateral locking plate and dual plating in the treatment of bicondylar tibial plateau fractures. J Orthop Surg Res. 9, 62. Chae, IJ, Park, SW, Lee, SH, Noh, W, Kim, HJ, and Hahn, SB (2009). Treatment of Shatzker type VI tibia plateau fracture using lateral and posteromedial dual incision approach and dual plating. J Korean Fract Soc. 22, 252-8. Insall, JN, Dorr, LD, Scott, RD, and Scott, WN (1989). Rationale of the Knee Society clinical rating system. Clin Orthop Relat Res, 13-4. Chang, YH, Tu, YK, Yeh, WL, and Hsu, RW (2000). Tibial plateau fracture with compartment syndrome: a complication of higher incidence in Taiwan. Chang Gung Med J. 23, 149-55. Bhattacharyya, T, McCarty, LP, Harris, MB, Morrison, SM, Wixted, JJ, Vrahas, MS, and Smith, RM (2005). The posterior shearing tibial plateau fracture: treatment and results via a posterior approach. J Orthop Trauma. 19, 305-10.